Fantasia broke the long-run record at the venue in its 28th week, breaking the record of Gone with the Wind. It attracted over 500,000 people with reservations from cities 100 of miles. Fantasia grossed over 300,000 in the first 16 weeks in New York, over 20,000 in the first 5 weeks in San Francisco. The first 11 shows earned a total of 1.3 million. In the 1960s, is when Fantasia definitely started making a profit. Fantasia holds a 96% on Rotten Tomatoes with an average score of 8.6 of 10 stars. TV Guide awarded it 4 stars. The Chicago Sun-Times rated it 4 stars. Fantasia was ranked 5th at the 1940 National Board of Review Awards in the Top 10 Films category. Both Disney and Stokowski won Special Awards for the film at the New York Film Critics Circle Awards. In 1990, Fantasia was selected for preservation by the National Film Registry. “On the 100th anniversary of cinema in 1995, the Vatican included Fantasia in its list of 45 “great films” made under the Art category; the others being Religion and Values.” (Wikipedia) Fantasia is in 3 lists: #58 in 100 Years… 100 Movies in 1998. 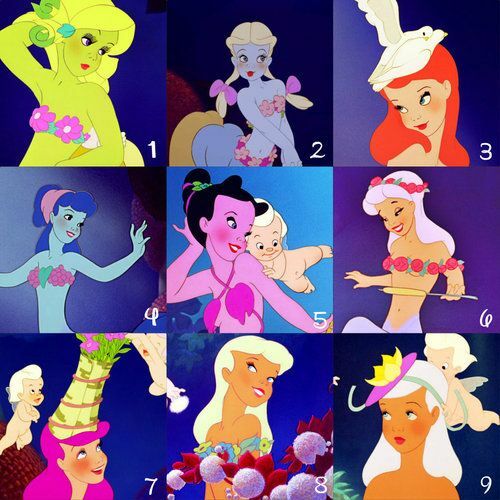 The 10 Top 10 List ranked Fantasia #5 under Animation. 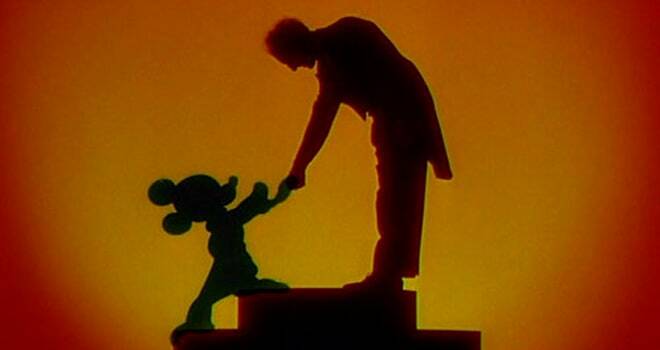 Fantasia won two honorary Academy Awards: 1 for Walt Disney and 1 for Leopold Stokowski. Fantasia won for the DVD Exclusive Awards in 2001 for Best DVD Overall Original Supplemental Material. (Anthology) It was also nominated. It was nominated for the Hugo Awards. It won the National Board of Review (Top 10 films.) It won the National Film Preservation. It won the New York Film Critics Circle Award. It won the Online Film & Television Association. During the 1960s, 4 shots from The Pastoral Symphony were removed that depicted 2 characters in stereotypical manners. A black centaurette named Sunflower was polishing the hooves of a white centaurette. A second named Otika appeared briefly. In 1992, the Philadelphia Orchestra, sued The Walt Disney Company. The Orchestra demanded since they were co-creators, that they deserved half of the estimated 120 million dollars in profit. In 1994, the lawsuit was dropped when the two parties reached an undisclosed settlement. Alright, so one of the complaints that Fantasia gets a lot is the racist centaurettes. There honestly isn’t an excuse for it. But, they knew they were wrong and they removed the characters. Should they have put it? No, but it’s not like they can go back in time and change it. The only thing they can do is solve the problem which they did. So, I don’t think it is fair to bring into “Disney’s history of racism” when they have removed the issue. Also, they did use two beautiful African centaurettes, especially in a time when African people were not kindly depicted in the media or life. The next controversy is The Night on Bald Mountain scene. I never found it frightening as a child, but like I’ve said I was a weird child. I think it should be included in the movie. It is the climax of the movie, and to remove it; the movie wouldn’t work as well as it does. The movie has been out for nearly 80 years, so if parents feel like it is a problem, than they can skip the scene. If, they somehow never heard of this scene, then the parents should watch the movie before they show it to their children, to see if it is appropriate. Besides, those two complaints, Fantasia don’t appear to have any other controversies/complaints and receives much praise. Fantasia is not an actual location or time. It is just pure fantasy. 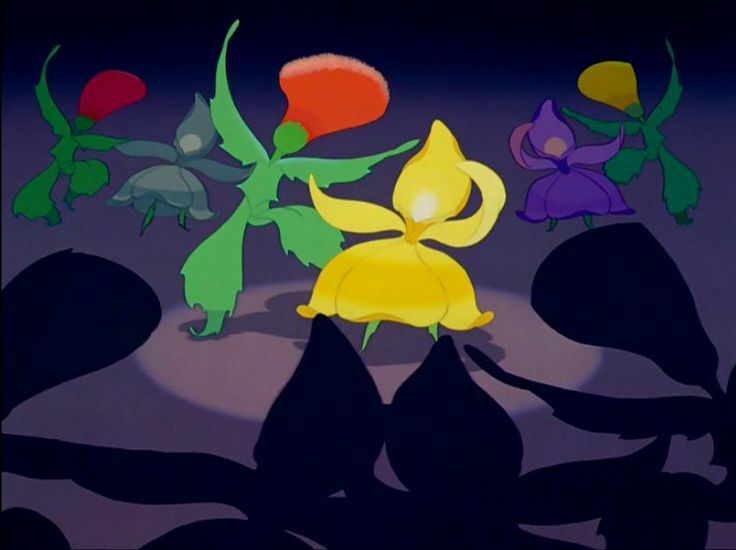 The Fairies- Controls nature; different types depict the different seasons. Summer Fairies- Green and change spring to summer. Autumn Fairies- Orange and Grey and change summer to autumn, which results in the leaves falling and changing color. Frost Fairies- Ice Blue, turns autumn to winter, icing lakes and rivers. Hop Low and the Mushrooms- 6 mushrooms dance The Chinese Dance. 1 is smaller and misses the steps of the dance (Hop Low). Dancing Thistles and Orchids- Perform Russian Dance. Dancing Thistles are Cossacks and the Orchids are Peasant girls. The thistles (white, pink, rose, red, orange, and yellow) dance after the orchids (white, pink, yellow, blue, violet, and orange). Then they dance as couples. Mickey Mouse- the apprentice to the sorcerer. Broomsticks- Broomsticks come alive after Mickey transforms them. 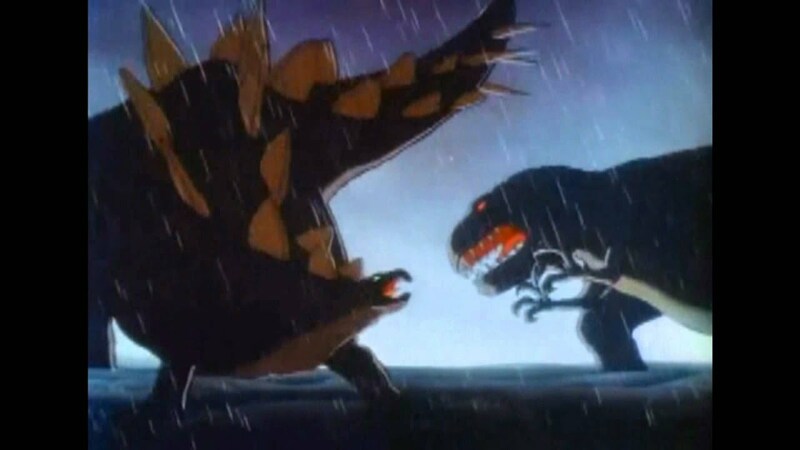 Stegosaurus- Herbivore, Fight scene with T-rex. Other species included: Anklyosaurus, Triceratops, Troodon, Archaeopteryx, Brontosaurus, Ornithomimus, Parasaurolophus, Trachodon, Plateosaurus, Massospondylus, Lambeosaurus, Corythosaurus, Diplodocus, Kritosaurus and Gryposaurus, Psittacosaurus, Hypsilophodon, Coelophysis, Brachiosaurus, Yaleosaurus, Chasmosaurus, Camptosaurus, Oviraptor, Camarasaurus, Ceratosaurus, Trilobite, Jellyfish, Polypterus, Aphetoceras, Eusthenopteron, Pterichthyodes, Cladoselache, Placochelys, Elasmosaurus, Tylosaurus, Pteranodon, Lunaspis, Dimetrodon, Nothosaurus, Hallopus, Kannemeyeria, and Dimorphodon. Brudus- Black-haired blue centaur with purple horse legs. Falls in love with Melinda. Centaurs- Male centaurs that come in different hair and skin colors, falls in love with centaurettes. Melinda- Blonde-hair blue centaurette with pigtails. Falls in love with Brudus. Centaurettes- Female centaurs that come in different hair and skin colors, falls in love with centaurs. Zebra Centaurettes- Female African Centaurettes that help take care of Bacchus . They are half zebra and half Nubian. 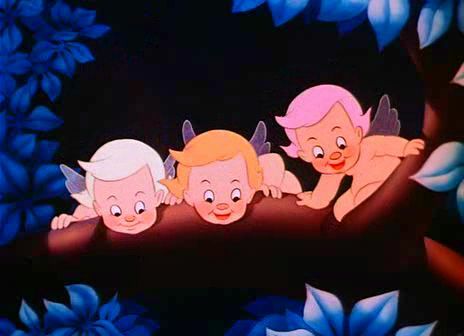 Cupids- Winged baby creatures that help the centaurettes fall in love and get ready. Fauns- Horned creatures that are half goat and half human; play the flute. Zeus- King of the Gods. Villain in this segment. Vulcan- Blacksmith of the Gods and provides Zeus’s thunderbolts. Unicorns- Horses with horns on the head; good friends with the Fauns. The Pegasus Family- Winged Horses; Focuses mainly on the Father Pegasus (Black), Mother Pegasus (White), and their 5 children (Pink, Blue, Orange, Yellow, and the main one black). Madame Upanova and Ostrich Class- Madame is a pink dressed ostrich, and the others are blue dressed. Likes grapes and dances in the morning. Hyacinth Hippo and Hippopotamus Servants- All wear pink and dance in the afternoon. Main hippo sleeps while the servants are made to dance by the alligators. 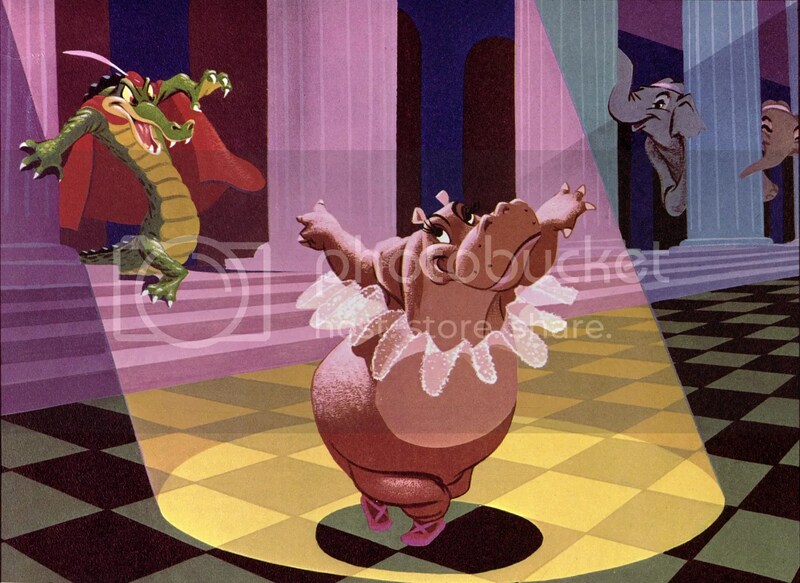 The main alligator falls in love with Hyacinth and dances with her. Elephanchine and Elephant Partners- Wear Ballet slippers and dance during the evening; dances with bubbles. Ben Ali Gator and Alligator Rivals- Prince of the alligators and wears feather on head. Falls in love with Hyacinth and they dance. The other alligators force elephants to dance. They dance during the night time. Chernabog- Massive Nocturnal Devil who takes people’s hearts and holds power over restless souls. Walt Disney refers to him as Satan himself. Chernabog’s Minions- Evil creatures summoned by Chernabog, including vulture, ghosts, demons, spirits, walking skeletons, goblins, imps, satyrs, zombies, fire women, hags, harpies, and werewolves. Monks- Appear with light, cross the meadow, towards the light showing that good always conquers over evil. This is one of my favorite Disney movies. Surprisingly, I’ve never met an actual person that has seen it. I know a lot of people online that have seen it and liked it, but I’ve never met a real person. I loved watching this film when I was little, but I was also a weird child. I’ve heard that many people dislike it and children find it boring. So, I would recommend not watching the film as a whole, but as segments. Like, one day watch The Sorcerer’s Apprentice, another day watch The Pastoral Symphony, and so on. We start off with the first segment: Toccata and Fugue in D Minor. We begin by using color and showing the musicians playing their instruments. 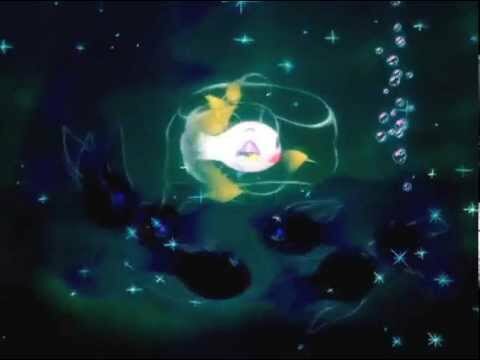 They use lightning, rain, wind, and other various shapes combined with the music. It ends with a beautiful colorful finish. The next segment is The Nutcracker Suite. We are introduced to the fairies. They’re bright and different colors. They change the flower and spider web colors. It’s a really beautiful piece. We then meet The Mushrooms who do The Chinese Dance. Hop Low (the tiny mushroom) tends to be off-beat compared to the others, but keeps trying his best. Then, comes along the flowers that transform into blossoms, and dance away onto the waterfall. We meet the goldfish. It focuses on mainly 1 goldfish, but they all dance the Arabian dance. Then we meet the thistles and orchids. The thistles dance and then the peasant orchids dance together. Next, we are introduced to some new fairies. They change the seasons. The next segment is The Sorcerer’s Apprentice. We meet Mickey carrying two buckets full of water to the well. Yen Sid (the sorcerer) is tired and he goes to bed. Mischievous Mickey Mouse gets the bright idea to wear the Sorcerer’s hat and bring the brooms to life to do his chores. The brooms throw the water in the well until it floods, while Mickey is sleeping. The brooms keep throwing the water in, as Mickey continues to dream until Mickey is woken up. He tries to stop the brooms by cutting them down, but that doesn’t work and they continue their job. Yen Sid comes along, and stops everything, disappointed in Mickey Mouse. Mickey runs to continue his chores while Yen Sid spanks him with a broom. The Rite of Spring is the next segment. We are introduced to “evolution.” We start off with the sky and then we come across some erupting volcanoes filled with hot lava. Then we see cells and other similar microcosms. After, a very long wait, we are finally introduced to some dinosaurs. We meet all kinds of species of dinosaurs. The two biggest stars are the Tyrannosaurus Rex and the Stegosaurus. The Tyrannosaurus looks for his prey where he sees his perfect match, the Stegosaurus. The other dinosaurs run away, as they watch the great battle. They fight it out, the Stegosaurus desperate to live. But, the tyrannosaurus rex proves to be a great foe, and destroys the stegosaurus, devouring him. Then we come across the next scene which is a hot desert. The dinosaurs trudge along, but no food or water, they all die. This scene represents the extinction of the dinosaurs. Earthquakes swallow up the ground, new landforms are created, and a giant flood swallows everything up. Then darkness forms and it is pitch black. The next segment is the intermission. Basically, the orchestra leaves to take a break. The orchestra comes back, and plays their music. We are then introduced to the soundtrack character. The host explains what he does, and we see what the soundtrack does in animation form. The Pastoral Symphony is the next segment. We first meet some colorful unicorns frolicking in the pastures. They join the fawns playing their flutes. We come across the lovely Pegasus family. 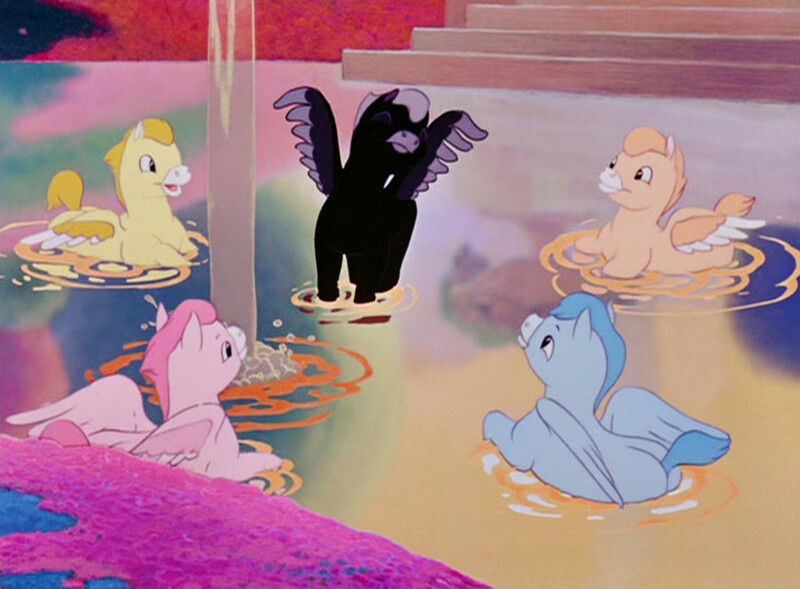 The Pegasus family includes the mother and father, and their five colorful children, particularly the little black Pegasus. His brothers and sisters eat some grapes, while the black Pegasus tries to learn to fly. Mother Pegasus gets her baby after he’s fallen, and helps him fly. They swim in the water to the other Pegasus’s. The next scene is beautiful half-naked women bathing, but they’re not just any kind of women. They’re centaurettes- the body of a horse and the top half of a human. The cupids help get them dressed up as the centaurs appear. The lovely blue centaurette makes the first move, the blue centaur catching it, and giving it back to her. The centaurs and centaurettes become couples and go off to do their own thing. Only two are alone, Melinda and Brudus, but the cupids unite them and they fall in love. The next scene is a party filled with wine where we meet Bacchus (the God of Wine) and Jacchus, his pet unicorn-donkey. Bacchus becomes drunk, playing around, and chasing the centaurettes around. Until, Zeus comes around, and decides to play with them. Zeus causes it to rain and decides to try to strike them with lightning, until he grows tired. He goes to sleep as Iris and Apollo comes out, bringing the sun and rainbow, making everything happy again. 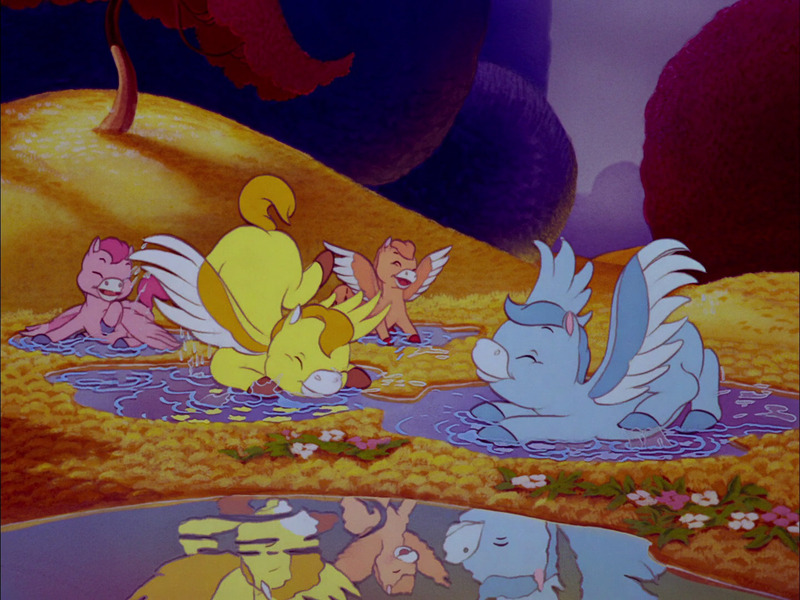 Everyone comes out, the little Pegasus’s play in the rainbow as the fawns play their flutes, and everyone is happy. The second to the last segment is the Dance of the Hours. It is morning time and we meet Madame Upanova and the other ostriches. They dance, and are hungry for lunch. Madam feeds her friends, and as she is about to eat, the others become greedy and try to take hers. They fight over the grapes and drop it in the water. Bubbles appear and they fearfully run away. From, the bubbles, comes along Hyacinth Hippo and the other hippos. It is the afternoon. They dress and dance until Hyacinth gets tired, and falls asleep on a couch. As, the evening approaches, along comes the dancing Elephanchine and the other elephants. They dance and blow bubbles until they are blown away. The night begins and Ben Ali Gator and the other Alligators appear. They see Hyacinth sleeping, and want her. But, the one that wins her is Ben. They dance a beautiful duet. 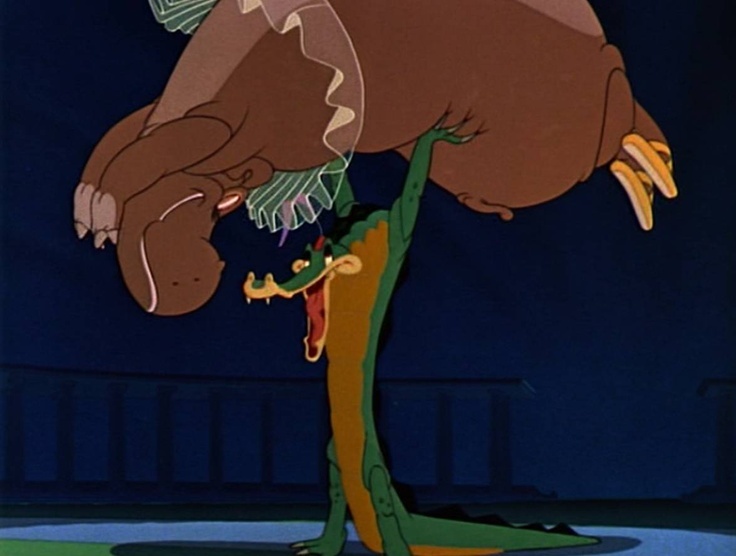 All the animals with a little nudging from the alligators dance together until the building crashes and falls apart. The last segment is The Night on Bald Mountain/Ave Maria. We are introduced to the devil himself, Chernabog, and all of his many frightful minions. He conjures them up, and it’s like they are there with you. The demons dance over the pit of hell, and Chernabog in a scene, where it seems like he is staring right at you throws his minions into the fire. Chernabog is about to wreak havoc when you suddenly hear bells and the light comes in. 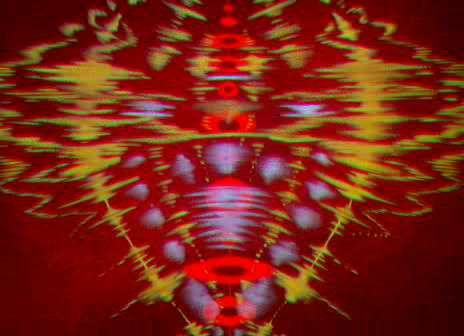 The demons are sent back, and Chernabog goes to sleep? The Ave Maria shows the monks walking with their lights to the sun. It signifies that the light will always defeat the dark. 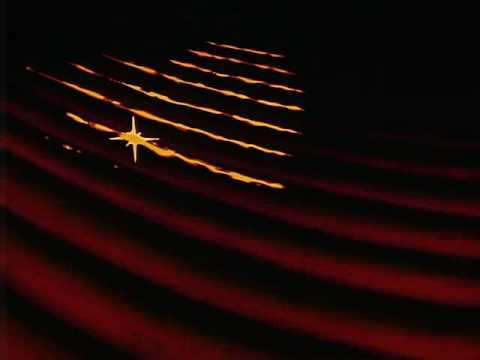 The Toccata and Fugue segment is a great introduction piece. It sets the tone of the movie, the bright colors, the shapes, and so on. I’m not really a big fan of abstract art, but it really fits the piece. I liked when they made the light combine with the water. I thought it was very beautiful. The Nutcracker Suite has some of the most beautiful music. It’s an enchanting piece and very creative. You can’t take your eyes off the screen. The animation is beautiful and it is a very well-done piece. 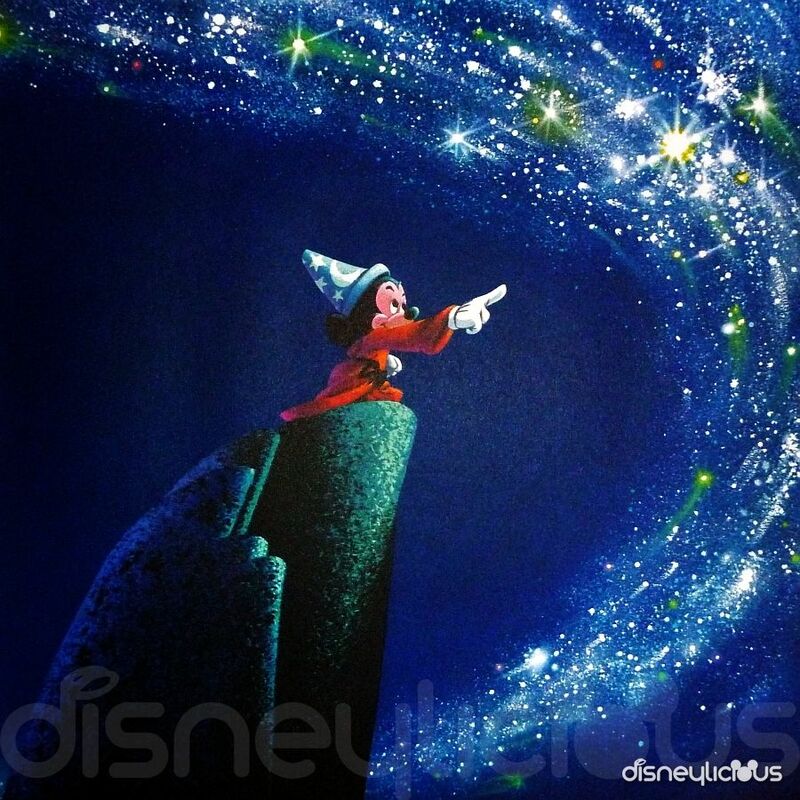 The Sorcerer’s Apprentice is the only piece in Fantasia that has an actual story/plot. It’s one of the most memorable and it’s very cute. It helped Mickey’s popularity. The Rite of Spring while can be long, will leave you at the edge of your seat. The fight scene will send you through an emotional rollercoaster, from happiness to fear to sadness. The animation is stunning, especially the t-rex. The t-rex is truly terrifying. The Pastoral Symphony which happens to be my favorite segment. The absolutely stunning and the characters are very compelling. The music is pretty. It is a scene that I find the most intriguing. The Dance of the Hours is amazing. Ballet is art, and when you combine it with animation, it is brilliant. The characters are enchanting, and it is a delightful piece. The Night on Bald Mountain is one of the last segments, and I honestly forgot how impressive it was. The demons look 3-D like, and like they’re going to pop out at you. The scene can be quite frightening, but it is worth it. Both the animation and music are beautiful. It would have been nice to see the early mammals, ice age, and humans in The Rite of Spring. It would’ve been cool to see how they would’ve done a saber tooth tiger and a mammoth. But, I understand that they couldn’t because of creationists. It wouldn’t be worth all the trouble they would cause. I don’t find the beginning necessary. In three minutes, you are just watching the orchestra come to their instruments and set up, which isn’t really interesting. While the other segments, are pretty fast. Once, you come to The Rite of Spring, it feels endless. It is a brilliant piece, but at times can feel long and at parts wondering when will it end. The Intermission I find pointless. I understand using it when it was in the theater, but I don’t find the importance it in the DVD. It is very boring and honestly I skipped half of it. My favorite character is this little guy. He’s charming, adorable, cute, adorable, and did I mention adorable? I’ve loved him since I was little. I just think he is one of the cutest things. My favorite song; how can I choose only one? The entire soundtrack is absolutely amazing. After, watching the movie, and listening to the soundtrack twice, I finally chose 1 song: Toccata and Fugue in D Minor. It was a difficult decision, but there’s just something about Toccata. It has this appeal to it. It’s sweet, but also “aggressive.” It is an absolutely brilliant piece. My favorite scene is The Pastoral Symphony. I’m a huge fan of Greek mythology. So, it would only come natural that I would choose this scene. I like all the characters, particularly the pretty blue centaurette and the Pegasus’s. Ever since I was little, I just always found this scene to be the most interesting. We have begun a new decade full of Disney Magic. We start off with the next Disney movie, Dumbo. I’m pretty sure most people have seen it, and how could you not love that adorable elephant. Well, I hoped you enjoy. Thank you for reading and I bid you Adieu until next time. While I admire this to be a well-made film, I honestly dislike it the most! It’s my least favorite film in the Disney Canon as it bores me! Weirdly enough, I do like Fantasia 2000 though. Thank you! Really? lol I like the film. Are you not a fan of classical music? 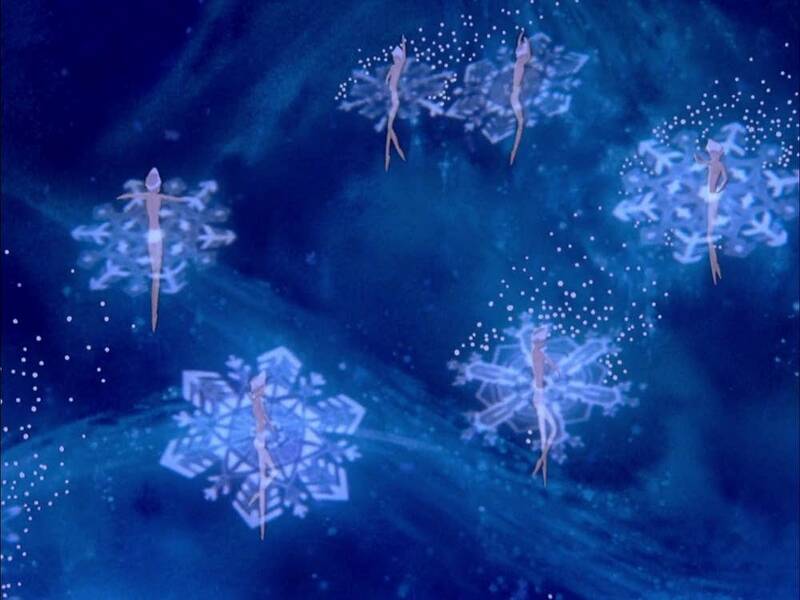 I do like Fantasia 2000, but I don’t like it. I only like certain segments to be honest lol. Yeah, I’m not into classical music. My favourite scene changed over the years…I finally settled on NoBM. It’s easily the boldest (pun intended) of the segments, and the most creative. Yes, that segment is amazing. I had honestly forgotten how great it was lol.